This product requires the base game Mafia II. Show off your inner renegade in this new DLC pack. Start with 2 new cars, one with the slick styling and tight handling of a small sports coupe and the other with the revved up engine of a 50s hot rod. Outfit Vito in 2 new suits including leather and lettermen’s jackets to fit his renegade persona. Mafia ® © 1998-2010 Take-Two Interactive Software, Inc., and its subsidiaries. 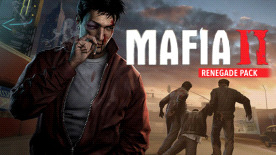 Mafia (r) II developed by 2K Czech. 2K Czech, 2K Games, Mafia, Mafia II, Take-Two Interactive Software and their respective logos are all trademarks and/or registered trademarks of Take-Two Interactive Software, Inc. All other marks are property of their respective owners. All rights reserved. Mafia II is required to play this DLC.